Please forgive me for taking so long to update, there were/are a lot of moving parts and many people that had to come together to get this mounted unit up and running. The movements of the last month haven’t always been easy, there were many long days and I have made more than one American style foible. I am grateful that all of the wonderful people involved with the project didn’t drive me back to the airport the first week, tell me “thanks, but no thanks” and stick me on a plane home. It is my true honor to be able to help move this project along with my equine experience and ability to bring much needed funding to the project. It was heart wrenching and heartwarming to me that something as seemingly simple as going to the local farm store and being able to fund the purchase of a water trough and a hundred meters of water pipe was a momentous occasion for the Equine A.P.U effort. Of all of the amazing animal related things I have experienced these last several weeks, I promise you that none of them has topped being in what is now the A.P.U horse pasture as the sun went down, standing in complete silence with Dani Jackson (the original project coordinator) watching that symbolic first water fill into a bright green trough. The mounted A.P.U unit will start with two horses that have graciously been loaned to the project by Giles Gush. He is one of the Amakhala Reserve partners and purveyor of Amakhala Horse Trails. It was a brilliant solution for the quickest success of the equine unit as the horses are gentle, well ridden in the bush and have experienced all non-dangerous wildlife. As the project moves forward it would be ideal to purchase horses specifically for the mounted unit so as not to impact the Trails operation. With that said, the purchase of the horses would have put a major dent in the budget and the training time for the aforementioned steps would have been insurmountable at this time. This cohesive approach is a fantastic solution and proof that working together for conservation makes the end goal obtainable. Most of my time is spent with the two young rangers that are interested in having equine partners and the two chosen horses that are now on property. I do still spend some time at Amakhala Horse Trails breaking some of the young horses. While it seems a stretch to think that breaking two and three-year-old horses is helpful to a mounted patrol unit I must explain that these young horses will be used to backfill some of the older horses that we take on for A.P.U use. 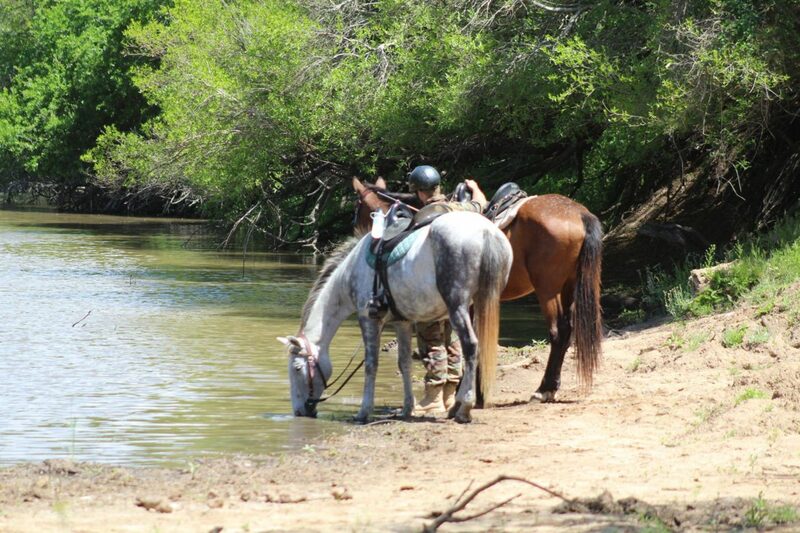 Once broke to ride the trails they will be gaining valuable bush experience and when the time comes to acquire more horses for the mounted unit we will have the opportunity to check in with Giles about possible purchase of well suited horses. 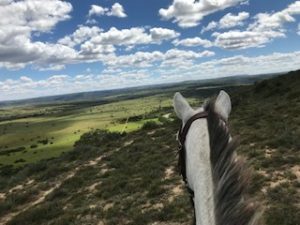 Conservation aspect aside it is my pleasure to help Giles and Amakhala Horse Trails in this way as they have offered so much time, hospitality and straight up horsepower to make this effort a reality….they also let me eat granny’s home-made rusks so I feel I do owe them some kind of sweat equity! The project has come a long way in just a month’s time; from an empty field to a functioning pasture with equine inhabitants, from rangers simply interested in the horse unit to BEING the mounted horse unit. I have personally come a long way from not knowing my role in the project to becoming the current “driver” on the ground, from being sidelined from horses for an exasperating fifteen months due to injury, to being able to ride several hours every day with only minimal pain. 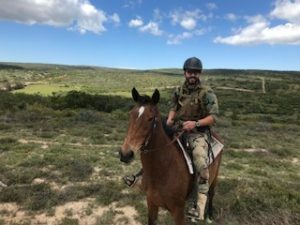 As the self-appointed “riding instructor” I had the opportunity to ride with the guys on their first active patrol on the main reserve a few days ago. It was incredible to be on that ride out, putting the first horse prints in the sand alongside that of the rhino and eles they are meant to protect. Midway thru the patrol as I stared out over my horses’ ears from high atop a location aptly named “God’s Window”, with its vast expanse, dramatic cliff and movie set clouds puffed perfectly above, I was filled with deep appreciation for the figurative and literal position I was sitting in as I knew I would be one of the few people outside of the mounted horse patrol allowed this inimitable experience. 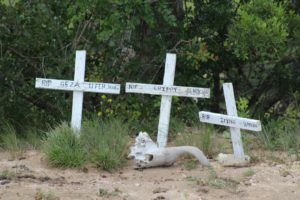 Just a few meters up the path there were three handmade crosses placed in memorial to rhinos that have perished here due to past poaching and I somberly remembered why I was here. I dipped my head in respect and it was time to go, we had to carry on with the patrol. While even three is too many, I must continue to believe that those three crosses will stand together for eternity without the addition of one more cross. Introducing our new "Wildlife Wine" series with Wilson Creek Winery! Thanks Roxane and GCF for your amazing boost to this project. Real progress and you are inspiring folks to take this forward with the same amount of passion you have shown for this cause. Wonderful stuff!! Thank you for the update and for the work you are doing here. Hoping this new equine unit we I’ll be successful in helping to protect and monitor t hg ese animaks. Wonderful work you are doing. I’m sure this new unit will prove to be most valuable!